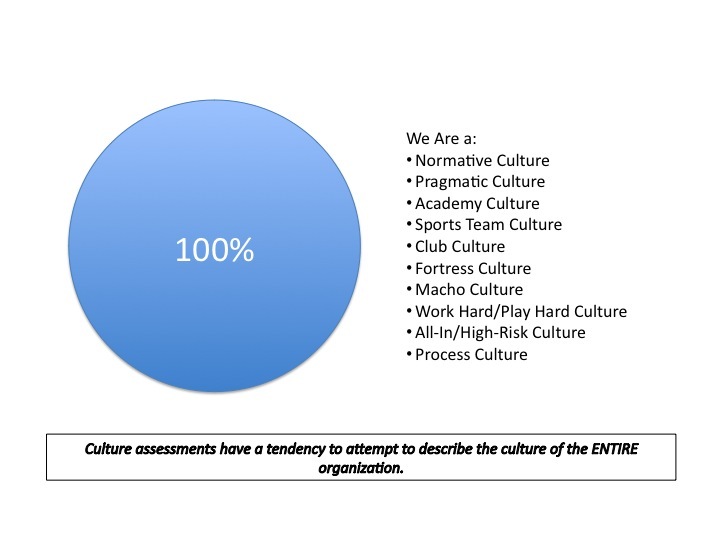 Leadership and associates in organizations have no dogmatic view of what culture is or is not. The idea is an academic one. The idea that there is one culture comes from elite professors claiming to bring the truth to the masses. In my years as both a consultant and executive I have never observed a leadership that thought their was one culture within their company. Many saw several that followed functional and/or geographic lines. It was under the direction of the experts that they came to see one culture. The institutionalization of organizations has been a stumbling block for real change to happen. Especially since the so-called “experts” include the consulting organizations themselves. Part of what I am trying to do here is remove that view. It is high time that we stop looking at our organizations as mechanical, physics-based entities and begin seeing them for what they really are…Another emergent layer of life itself.